Researchers at the National Institute for Standards and Technology (NIST) have developed an atomic clock that is so precise that our models of Earth's gravity aren’t accurate enough to keep up with it. As detailed in a paper published this week in Nature , the atomic clock could pave the way for creating an unprecedented map of the way the Earth’s gravity distorts spacetime and even shed light on the development of the early universe. Andrew Ludlow, a physicist at NIST and the project lead on the organization’s new atomic clock, told:. Quote: The level of clock performance being reported is such that we don’t actually know how to account for it well enough to support the level of performance the clock achieves. Right now the state of the art techniques aren't quite good enough so we’re limited by how well we understand gravity on different parts of the Earth. 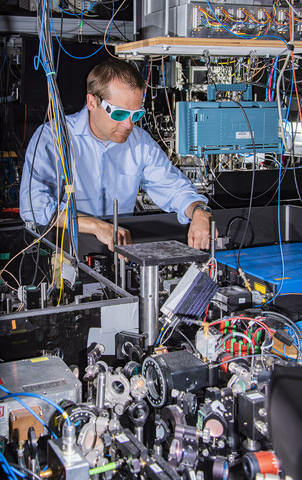 Before diving into the nitty gritty of what Ludlow and his colleagues at NIST have accomplished, however, it will help to have some background on the nature of time and atomic clocks. WHAT IS TIME AND HOW DO ATOMIC CLOCKS MEASURE IT? Regardless of what your college roommate said while you were hitting the bong, as far as most scientists are concerned time is a measurement of periodic occurrences. In other words, time is the thing that measures it, otherwise known as a clock. Pretty much anything that occurs at regular frequencies can be regarded as a clock, such as the swing of a pendulum, the rotation of the Earth around its axis, or the philosopher Emanuel Kant taking his morning stroll around the neighborhood. Obviously, not all clocks are created equal. Each clock varies in terms of its accuracy (how much its oscillation frequency deviates from some baseline) and its time scale. If you needed to measure the passage of five minutes, using the Earth’s rotation as a clock isn’t going to be particularly useful. Likewise, if you never wound your watch, it would gradually become less accurate over time due to small imperfections in the mechanics. Most of us deal with timescales ranging from years to seconds, which don’t require incredibly accurate clocks. Yet for scientists working on the bleeding edge of physics, they require much more precise measurements of the passage of time. Fortunately, nature came endowed with incredibly precise clocks of her own in the form of atomic energy transitions. Electrons orbit the nucleus of an atom at certain stable energy levels that depend on the electrical properties of the nucleus. These orbits can be changed by adding energy to the system, which causes the electrons to temporarily get bumped up to a higher energy level and emit electromagnetic radiation during the transition. Different types of atoms are able to absorb energy at different wavelengths and this feature is harnessed to create the most precise clocks in the world. The first atomic clock was created in 1955 and used the energy transition of an electron in a cesium-133 atom as its frequency referent. Cesium-133 atoms absorb energy at wavelengths of 3.2 cm, which means the wave oscillates at a frequency of 9,192,631,770 cycles per second. When cesium-133 atoms are hit with microwaves at this frequency, it causes the atom’s single outermost electron to rapidly transition between energy states at the same rate. In this case, the electron transitioning between a high and low energy state over 9 billion times a second is analogous to a rapidly swinging pendulum in a conventional clock. In fact, the transition of the cesium-133 electron was used to formally define the length of a second in 1967. Today, four atomic clocks can be found on each of the 24 GPS satellites orbiting Earth and are used to synchronize time in our cell phones and billions of other internet connected devices. They’re also used to measure the mean sea level, which is used to understand the way our planet’s gravity warps spacetime. 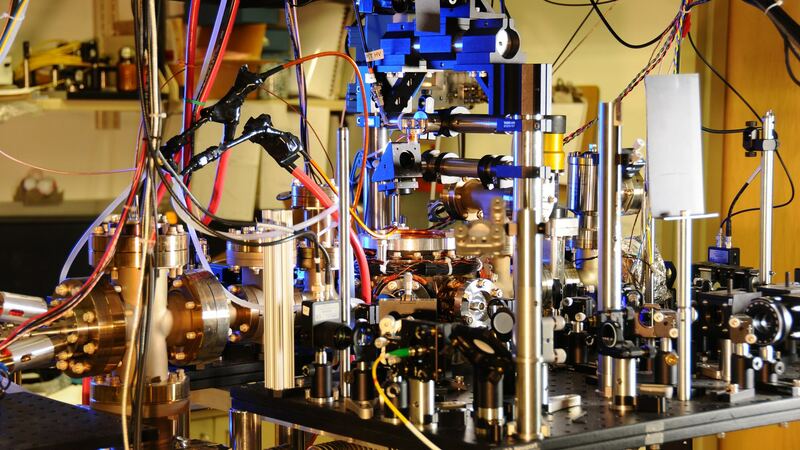 Knowing this information is important for calibrating the space-based atomic clocks themselves, but despite the accuracy of these clocks—NIST has an atomic clock that only deviates by one second every 200 million years—there’s always room for improvement. In this respect, NIST’s new atomic clock over-delivered. It’s so precise that our current models of Earth’s gravity can’t keep up with it. Fortunately, the new clock will help change that. There's no easy way to describe it but here we go. Electrons "bounce" in a highly predictable way when bombarded with photons. The bounce is predictable given a well understood & predictable source of photons. Some elemental forms give off predictable & highly precise photons as a result of radioactive decay, decay which can be maintained with a delivery of electrons. Essentially a caesium atom is used as a transformer, taking in power and delivering an extremely precise "beat" of photons, which can the be converted back into an electrical signal with the appropriate crystal. Basically an electron in certain atoms will oscillate back and forth between energy levels. Each time it does this it releases a microwave. These microwaves can be detected and counted and, crucially, the rate at which the electrons oscillate is always exactly the same relative to the atom so they always tick at the same rate. To be exact, 1 second is 9,192,631,770 oscillations of caesium 133 at absolute zero (or as close as we can get to absolute zero). That's literally the definition of 1 second and it can be replicated anywhere in the universe. This is how atomic clock works.